listen to dogs and the other is about dogs who listen to humans. According to each of these dogmas, training is required. The first is a new behavioral method of training your dog by listening to him. This is specifically not an extension of whispering to him. 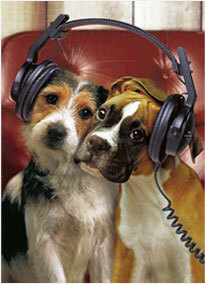 Jan Fennell, known as the "Dog Listener," is one of the leaders of a dog listening movement called Amichien Bonding. (Amichien: from the French words 'friend' and 'dog'.) 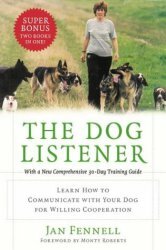 The The Dog Listener, by Jane Fennelldifference between dog listening and other training methods is that in dog listening humans don't try to dominate their dogs. Nothing is fear-based or aggressive. This training method, which is based on the pack behavior of wolves, is supposed to eliminate excessive barking, jumping up, nervous aggression, unsocial behavior, timidity, and anxiety naturally, without a struggle. Fennell has a training program for dog "communicators", and provides accreditation to "Canine Communication Dog Listeners" worldwide. She also has a few books out for you DIYers, among them The Dog Listener and Tales From The Dog Listener. Another book I just started by John Bradshaw, Dog Sense: How the New Science of Dog Behavior Can Make You A better Friend To Your Pet is very convincing. You can read Bradshaw's recent interview on NPR. Yes, we humans are training dogs to listen to us... specifically, we are training them to listen to children read... as well as look when a child shows them pictures in their books. 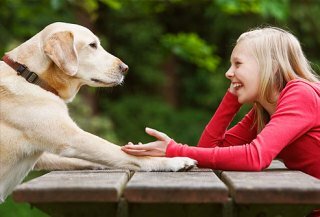 What goes on in the dog's mind during a reading period with a child, only the dog knows, but a listening dog has been trained to behave as if she totally understands the child. The listening dog program started in the U.S. about 10 years ago as a therapy dog activity. 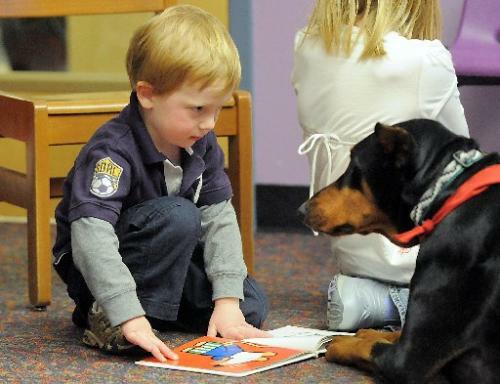 The specialized training for a dog is caled the Reading Education Assistance Dog (R.E.A.D.) program. Little kids apparently love to 'teach' others and, while reading to and being reinforced by a listening dog, they get lots of approbation. They read to the dog, show him pictures and explain them, and they gain confidence that they can be helpful to one who knows less about reading than they do. The self esteem is so rewarding to kids, they can't wait to read again... to a dog. There are dogs that are just cut out to be the right therapy dogs by temperament; that's why it's good to have a trained dog. But if your dog loves kids and is expressively responsive to voice, you can certainly 'try this at home.' There's plenty of information at TherapyAnimals.org. Or, you can volunteer with your dog as a therapy team. Apparently cats can also be trained for listening jobs. Off-hand, I can't think of a cat with quite the right disposition, but I would think that cockatiels and parrots are naturals to be listening birds. What Are The Top 10 Most Mischievous Pets?